Oh this is not my first go-around with spiced chickpeas. 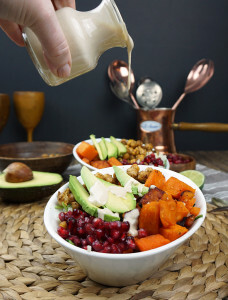 I ventured into that crunchy, spicy territory with this vegan Buddha bowl with spiced chickpeas. 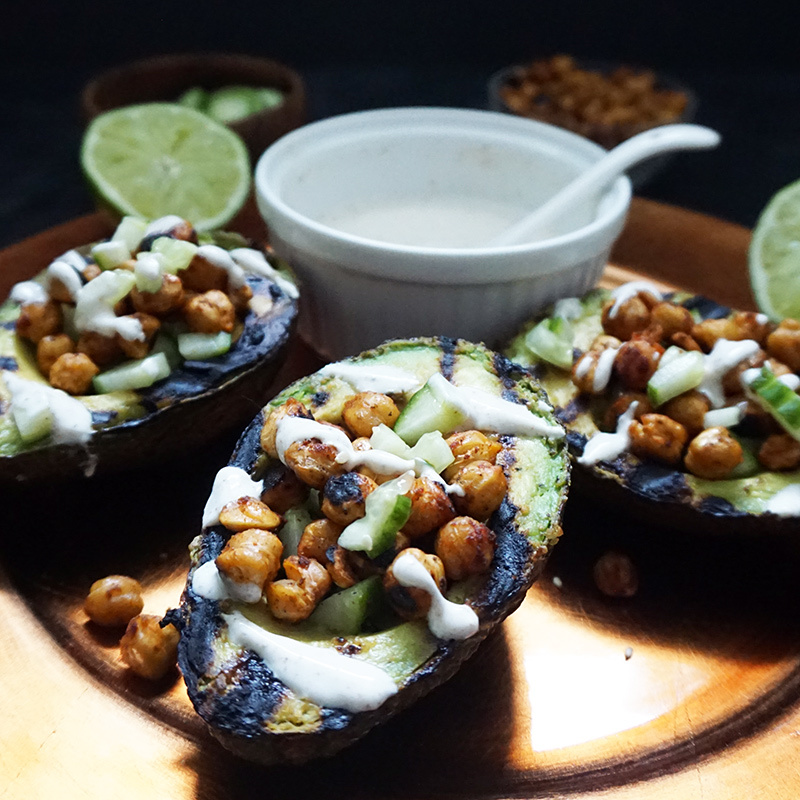 I’m re-using that part of the recipe to stuff up some avos for some healthy and delicious grilled avocados with spiced chickpeas. 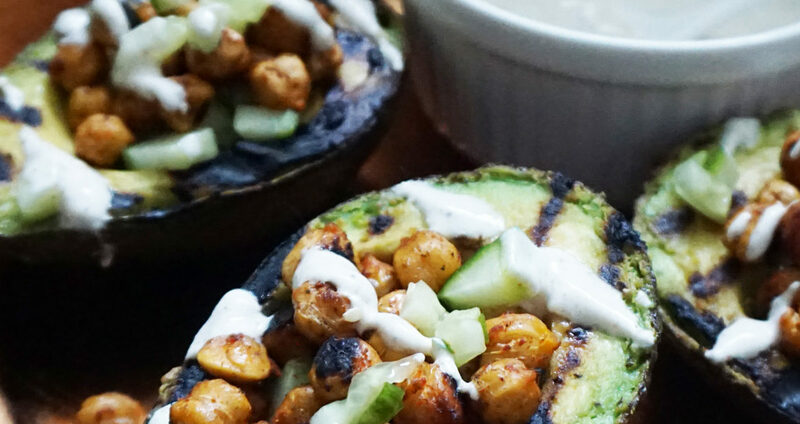 Grilling avocados works so much better than you might expect. Their soft insides don’t melt or get squishy like you’d think. They just char perfectly and become an awesome base for fillings. 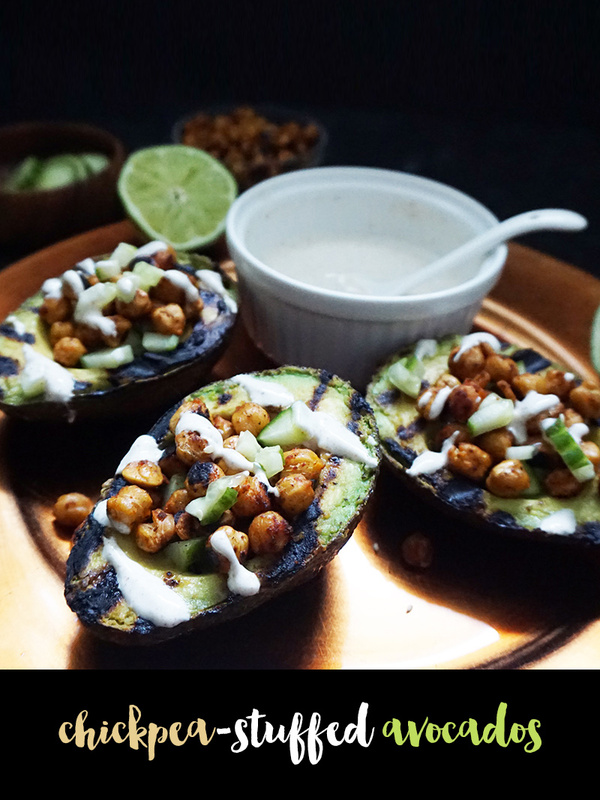 The fillings this time around include a little cucumber salad, the aforementioned spiced chickpeas, and a yogurt dressing. You ready for that? I know I am. 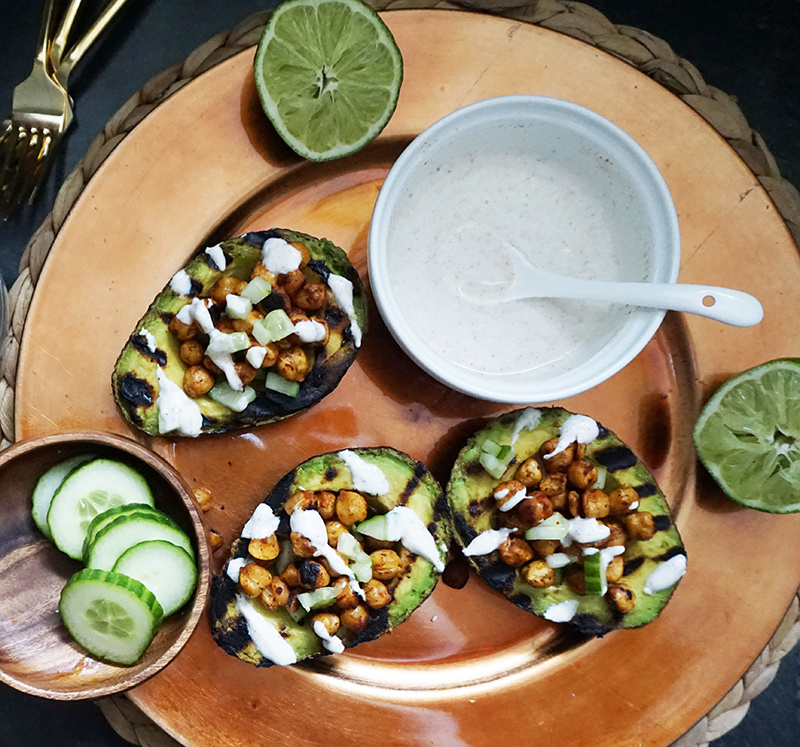 This whole dish can easily go vegan if you replace the yogurt in the sauce for tahini, by the way. Feel free to take it all the way vegan if you want. Oh, and more vegan recipes await you here, too. If you’re loving chickpeas in general, I’m right there with you. 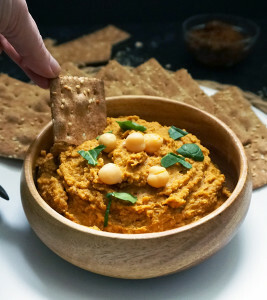 I particularly dig this coconut lemongrass curry hummus and butternut squash hummus. 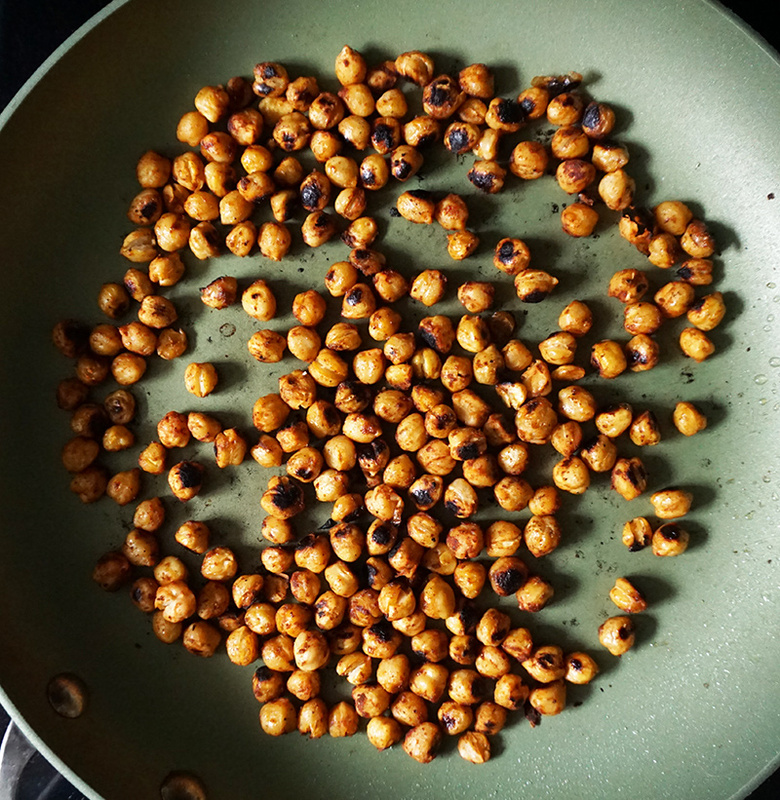 But there’s just something about a crunchy, spiced chickpea that is so satisfying. Give me hummus, but save me some whole chickpeas, too. Yum. 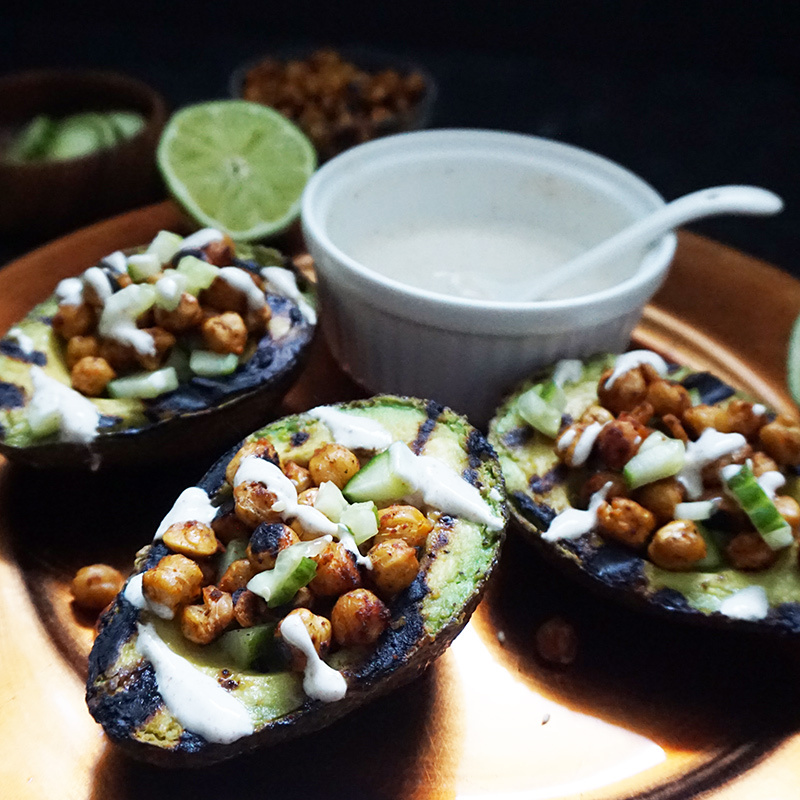 Then stuff them in grilled avocados and we are friends. 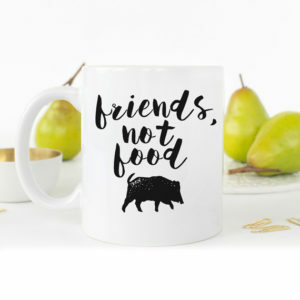 Friends who eat good stuff. Mmmm those grill marks, though. Place the rinsed and dried chickpeas in a small bowl. 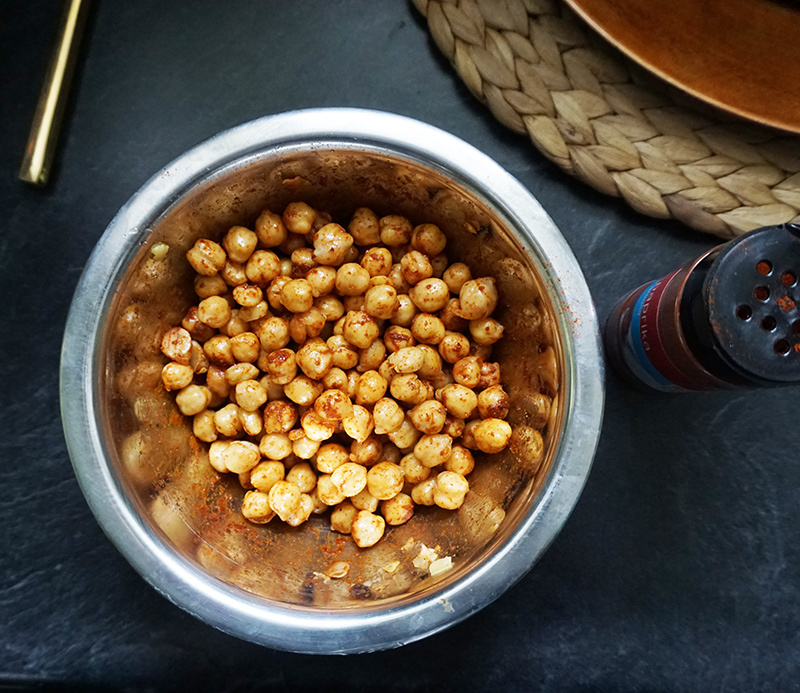 Spray or toss the chickpeas generously with your chosen oil, then toss with smoked paprika, 1 tsp garam masala, and a dash of salt and pepper. Place the chickpeas into the hot grill pan in a flat layer. Cook for 10 minutes. Add a bit more oil, toss the chickpeas, and cook for another 10-12 minutes until browned and crispy. Let cool and set aside. Cut the avocados in half and remove the pit. Scoop out the center of the avocado so you have a large hole. Spray or coat the avocados with oil and sprinkle with salt and pepper. 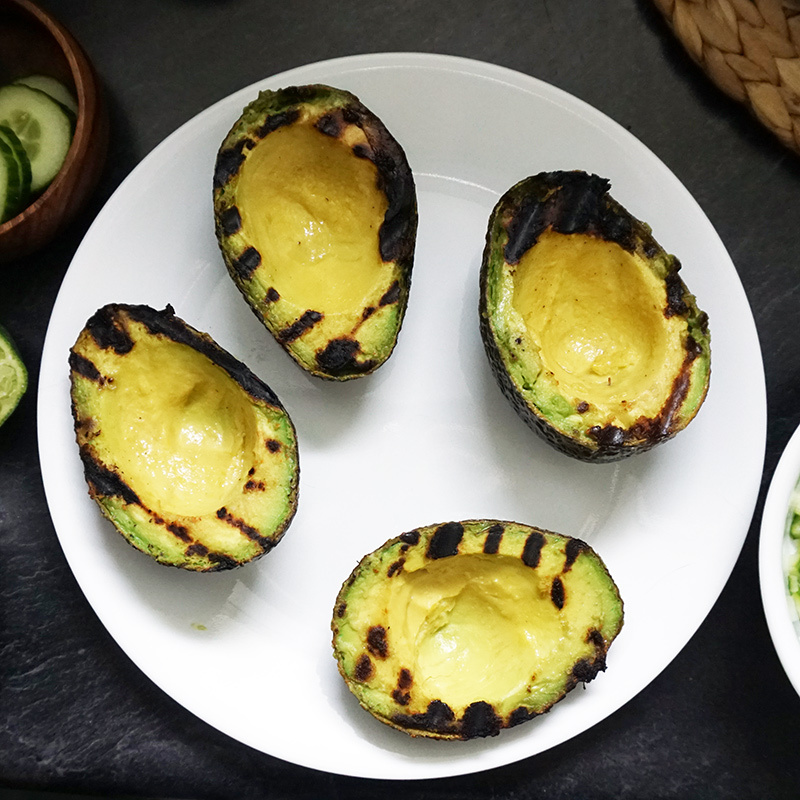 Place avocados flesh-side down onto the grill or grill pan and cook until dark grill marks form, about 4-6 minutes. 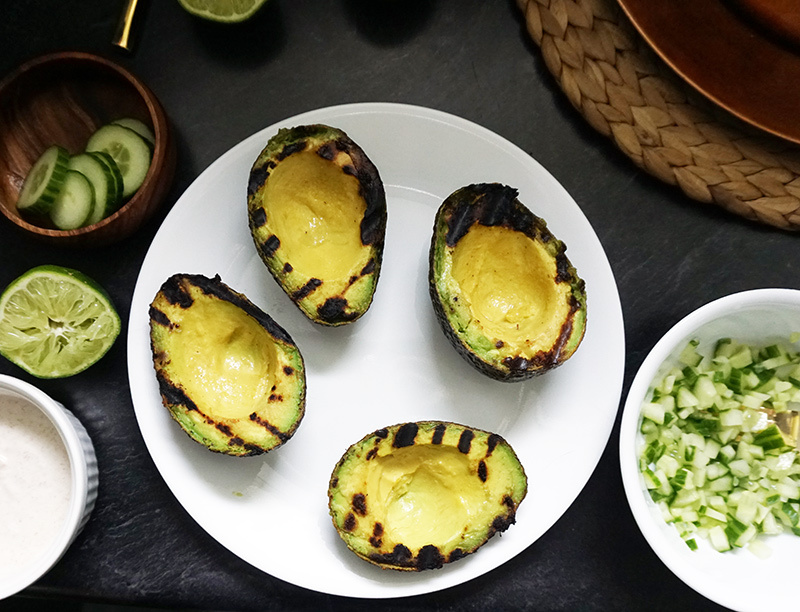 Don't be tempted to move the avocados around or you'll lose the grill marks. Meanwhile, mix the cucumber, 1 Tbsp lime juice, and 1/2 tsp salt in a small bowl. In another small bowl, mix yogurt with 1 Tbsp lime juice and 1 tsp garam masala. Divide the cucumber mixture between each avocado half. 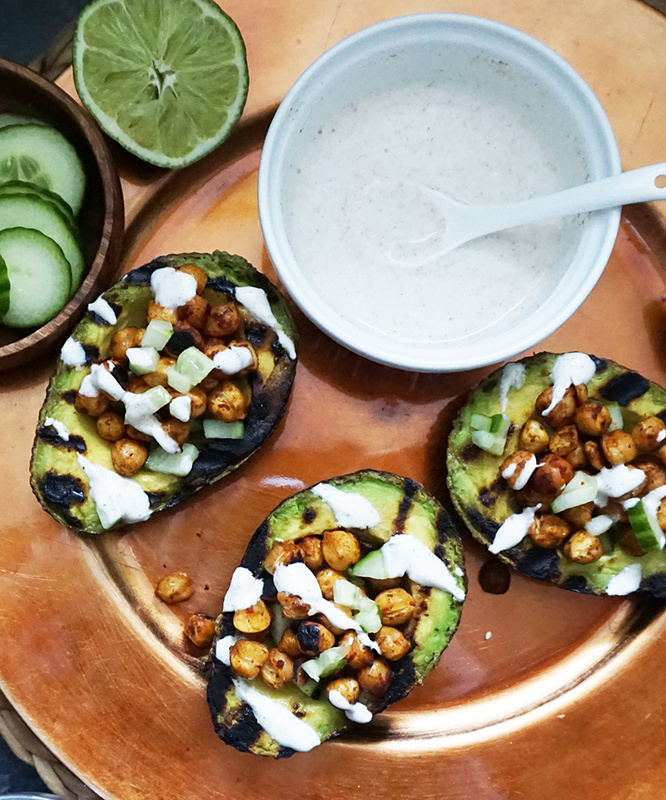 Top each half with 1 Tbsp of chickpeas and drizzle with yogurt sauce. Thanks, Casey! Thanks so much, I hope you try it! I saw this pic on FB through Finding Vegan and stopped in my tracks. Hope the boyfriend likes chickpeas! Hi, Amy, they get pretty tasty once they’re spiced. I hope you guys enjoy!